Relationship disagreements are part of being with someone intimately. Experts say that couples who have conflicts from time to time are happier, healthier, and more emotionally “together” than those who claim to never fight. Agreeing to disagree on certain issues can spark passion. Also, since you arrived at that conclusion despite your differences, that effort took a lot of trust, which is one of the most important relationship goals. You’re a Democrat; your partner is a Republican. You share different points of views and support different political leaders. However, you respect each other’s choices and don’t feel the need to change each other’s mind. As long as the political “debates” you have together involve positive thinking, then they’re not hurting anybody. Although talking about politics at certain times can cause difference of opinions, this difference can be good for your personal growth – and good for your relationship as well. It will help you to develop a more balanced perspective on issues that matter. Your partner is a health nut and you love to indulge in junk food. Your partner would never stomach the kind of food you eat, but you enjoy basking in the glory of chili cheese fries and lip-smacking burgers! Neither of you has to completely change your diet though, according to dietician Alissa Rumsey, via Brides. You can, however, compromise on your food choices and try each other’s meals or restaurants, or experiment with a new recipe from time to time. If you really don’t like the food, it’s not going to doom your relationship. However, if your partner ends up resenting how you don’t enjoy what he eats, then perhaps there’s more to the problem than just food. You might need to explore and discuss this, too. A relationship argument over a pet is more common than you think. Survey shows that some couples fight over the dogs’ care and discipline as often as three times a week. A couple’s disagreement over pets is usually highlighted by the differences in how much they can tolerate. Therapist Catherine Hastings said via Web MD that it’s important for couples to focus on solutions to specific problems with the pets and take full responsibility for those. By training your dog well, for instance, you can avoid arguments with your partner about these relationship differences. Having a pet is a big responsibility. If you’re considering one, however, be really thoughtful about bringing in a pet if your partner isn’t 100 percent into it because the pet might suffer from neglect later on. If you enjoy the same movies, TV shows or music, then great! But there are couples whose tastes are poles apart, too, and it doesn’t make their relationship any less successful. You don’t always have to watch or listen to the same things together but the diversity can be an advantage to your relationship. Fortunately, tastes can evolve and develop. You might even surprise yourself when you’re halfway through a documentary he’s wanted to watch for a while and you realize you’re enjoying it. As for spending quality time together, you don’t really have to watch what’s on TV while you’re in the same room, right? You can read a book or tinker with your iPad with your head on her lap while she’s watching a favorite Sunday drama on HBO! As for what to do during the vacation, it’s not a crime to disagree. However, traveling is actually a good time to be open to any experience, so perhaps keep an open mind. You might end up enjoying camping after all, even if you thought you’d hate it. 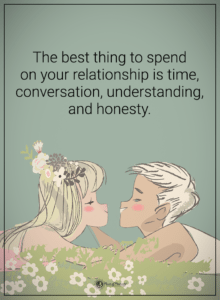 Yes, people in relationships need time alone and time apart from their partner once in a while. You can still value their solitude and “me-time” despite being in a comfortable twosome. You are, after all, an individual who needs to pursue personal passions. You’re a lot better in a relationship if you get to enjoy your private time. According to counselor Lanada Williams via Huffington Post, the mark of a healthy relationship is secure attachment – when you’re together with someone but you can still enjoy some alone time. A happy, healthy relationship doesn’t always have to jive on every single point. If you want different things in life, you can always work out the kinks. Besides, it’s the differences that can make your relationship interesting every day.